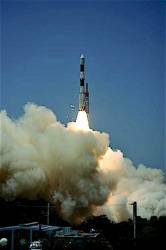 Yesterday (April 28, 2016) the Indian Space Research Organization (ISRO) successfully launched the seventh and final spacecraft for the Indian Regional Navigation Satellite System (IRNSS). The satellite, IRNSS-1G, was placed into orbit by a Polar Satellite Launch Vehicle (PSLV-C33). According to ISRO, the prime minister of India, Narendra Modi, watched the launch and “heartily thanked and congratulated” all the scientists and ISRO team for completing the IRNSS constellation, which he dedicated to the nation as “NavIC” (Navigation Indian Constellation). After separation from PSLV-C33, the solar panels of IRNSS-1G were deployed automatically. ISRO’s Master Control Facility at Hassan, Karnataka took over the control of the satellite. In the coming days, four orbit maneuvers will be conducted to position the satellite in geostationary orbit at 129.5 degrees East longitude. IRNSS is an independent regional navigation satellite system designed to provide position information in the Indian region and 1,500 kilometers around the Indian mainland. IRNSS provides two types of services, Standard Positioning Services (SPS), available to all users and Restricted Services (RS), provided to authorized users. A number of ground facilities responsible for satellite ranging and monitoring, generation and transmission of navigation parameters, etc., have been established in eighteen locations across the country. The successful launch of IRNSS-1G signifies the completion of the IRNSS constellation.